We have 35 HUD project-based subsidized apartments and 5 non- subsidized apartments. Your rent in the subsidized apartments will be based on 30% of your Annual income. There is no application or screening fee for our 35 HUD project-based subsidized apartments. All eligible applicants are screened for rental history, credit and criminal background. 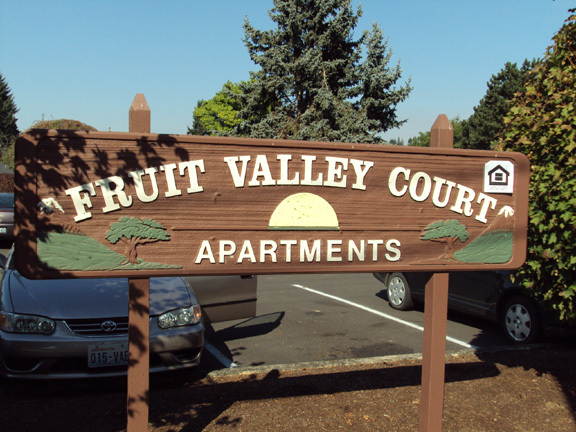 Fruit Valley Court Apartments is a small community, consisting of low income 1,2 and 3 bedroom apartments, within walking distance the the park and bus lines. Our convenient location and family atmosphere make it great place to live! Rent Detail: Rents shown above are for our non-subsidized apartments. We have 35 HUD project-based subsidized apartments and 5 non-subsidized apartments. Your rent in the subsidized apartments will be based on 30% of your Annual income. There is no application or screening fee for our 35 HUD project-based subsidized apartments. All eligible applicants are screened for rental history, credit and criminal background. Section 8 vouchers accepted in our non-subsidized apartments.